Advantages: Excellent photographs (approx. 250) and profiles (approx. 44). On December 16, 1940, after the conclusion of the Winter War, the Finnish government adopted the Mannerheim Cross as part of its system of honours. The honour was created at the urging of the Finnish Commander-in-Chief Carl Gustav Emil Mannerheim to reward members of the armed forces of Finland, irrespective of military rank. The authors chronicle the 19 recipients of the Mannerheim Cross who served in the Finnish Air Force during the Winter, Continuation and Lapland Wars. The problem is that most of the chronicling is in Finnish. However, there is a short overview, in English, of each of the recipients at the end of the book. There are also well captioned pictures, in English, throughout this volume. But even with the limited use of English, one can get a sense of the unbelievable bravery of these Finnish airmen. 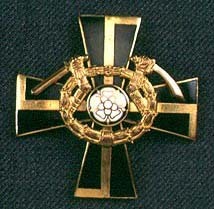 One thing is clear, one did not need to be an “ace” to be a recipient of the Mannerheim Cross. Many of the “Flying Knights’ were merely observers in reconnaissance aircraft or bomber pilots. Take for example Lt. Paavo Elias Kahla, who had completed 141 missions as an observer. He was recognized for his skill in gathering information for the military forces and facing both the hazards of enemy fighters and poor weather. On one occasion he crawled to the front seat of his Fokker C. X. after the pilot had been killed. Kahla flew the aircraft back to his base sitting on the lap of the dead pilot, only to flip the aircraft when he could not pull the stick back far enough because of his confined position. He survived. There is also Lauri Alfred Äijö, the last surviving FAF Mannerheim Cross recipient, as of the beginning of 2003, who was a “triple threat”. He was recognized for carrying out 104 successful long-range reconnaissance, photographing and bombing missions. But the pictures tell a wonderful story also. Like the picture of Eino Luukkanen, with a satisfied look on his face, standing in front of the tail of his Buffalo with 17 kill marks on the fin. As to the kill marks, for every aircraft shot down he would paste a label from a bottle of Lahden Erikos beer on the fin. Then there is the picture of Lt. Tauno Iisalo standing in front of his Ju 88 holdding his young son Matti. Looking more like a father and son at an air show, than a pilot who was on his way to completing 127 missions. I must admit at the outset, this book may have a very limited audience. No question about it, being able to read Finnish will be very helpful. But even if you don’t read Finnish, for those interested in the smaller air forces in general and the Finnish Air Force in particular, this is rewarding volume. As usual, the pictures are many and quite clear, and the profiles of the aircraft of the Mannerheim Cross recipients are well done. 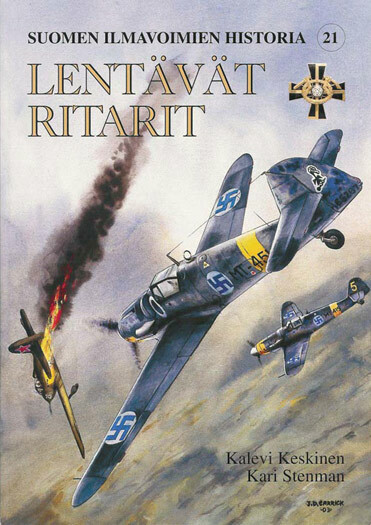 Of course I recommend this book, if for no other reason than to get more people interested in the Finnish Air Force.